Review Snapshot: The follow-up to 2009’s 'Down With Liberty... Up With Chains! ', and Chain And The Gang’s shtick has worn thin. Full Review: Ian Svenonius, a cult songwriter/front-man and creative multi-tasker, returns in his Chain And The Gang guise to continue pedalling his theatrical punk manifesto. This, as on their debut offering, is borne-out in the band’s ironic anti-freedom sentiments and fatalistic lyrics. 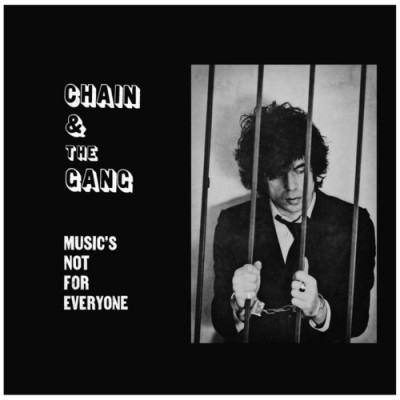 As on Chain and the Gang's first album, Svenonius uses musical genres previously seen as socially conscious or rebellious (for example seventies funk on 'Livin’ Rough' and '(I’ve Got) Privilege') and distorts them with his defeatist stance. This is problematic on various counts. Firstly, the mixture of genres has a jarring effect on the album’s overall sound. Secondly, while the styles may differ, the philosophy doesn’t vary greatly; which is the comic equivalent of a stand-up comedian telling the same one-liner in ten different accents. Even when the musical copy is indistinguishable from the source it aims to duplicate (such as the MC5-aping 'Detroit Music Parts I & II'), the results feel soulless. Aside from the comedy genre; parody, by its contrived nature, is apt to leave the listener cold. Lyrically we’re on well-worn ground too, and while dry humour was used somewhat effectively on the debut album, here it falls flat. To add to the disappointment, the album starts strongly, with the bluesy 'Why Not?' , followed by the playfully sardonic Not Good Enough. However, things deteriorate from there. Svenonius is a believer in a lo-fi approach to recording, and has been quoted as saying that “The whole problem with music is that people are thinking of it in this historical, sophisticated way.”. It’s a valid point, but in truth the rough and ready aesthetic soon grates. Songs contain a distinct lack of chord progressions or melody, which leaves many sounding monotonous and restricted. The use of female backing singers, previously an asset, is negated by their off-key delivery. The relaxed approach soon crosses the line in to lazy territory; of the album’s fourteen songs, three are alternative versions of tracks already included, and these have the quality of rushed b-sides. The album’s low-point is the title-track, a five minute-plus tedious and condescending diatribe attacking casual music listeners. Fans of the group protest that the song is deliberately bad as either a further attempt at irony (as a play on the album/track’s title) or as a test to weed-out the less devoted people experiencing it . Either way it’s a self-indulgent artistically vapid waste of time. Svenonius' stance throughout his career has been theatrically anti-authoritarian, but none of his posturing stands up to closer examination. The entire concept here isn’t enlightening on any level. And that’s the underlying problem, it’s not that the joke isn’t funny anymore; it’s that it was a dud joke to begin with. As the album’s opener drolly puts it, “who cares anymore?”.